Have you ever dreamed of living at the beach? Perhaps you-ve dreamed of a home tucked away in the country or nestled amidst natural beauty. Have you ever passed up an opportunity to live at your dream location for the practical convenience of living in town close to everything? What would it be like to have the best of both worlds? I-ve often asked myself that same question, until I found the answer. Located just inside Wilmington, North Carolina lies a community unlike any other along the coastal area of this state. Just two and a half miles from Wrightsville Beach and a half a mile from Mayfaire Town Center, is The Village at Mayfaire. The Village at Mayfaire is a luxurious condominium community surrounded by ponds, nature trails, and beautiful vegetation. Just steps from your own front door you-ll find Mayfaire Town Center, complete with abundant shops, extravagant restaurants, and fine entertainment. Stroll down the sidewalk and peek into a number of stores. If shopping doesn-t appeal, take a short drive and take a walk on the beautiful, sandy beach and breathe in the aroma of an ocean breeze. 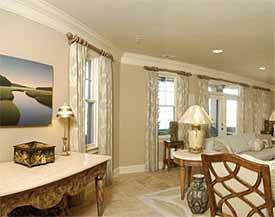 The Village at Mayfaire is, indeed, "Coastal Living Redefined." Consisting of 13 three- story buildings, The Village at Mayfaire is said to be "defining new urbanism in the area." In the center of sixteen condominiums is an enchanting courtyard. The exterior of each condominium features exquisite architectural design highlighted by shake and lap siding, decorative brackets, metal hip roofs and ornamental iron railings. Each condominium includes many bonuses like 9-10 foot ceilings, French doors, walk-in closets, large windows, lavish bathrooms, and stainless steel appliances and granite counter tops in the kitchen. Although these luxurious perks are standard in each unit, you still have an opportunity to pattern your condo to reflect your own personal style. Each homeowner has the option to choose from 6 different floor plans, consisting of 2 and 3 bedroom layouts and ranging in size from 1,260 to 2,037 square feet. Unlimited paint colors is a distinct choice not usually offered in condos like these. 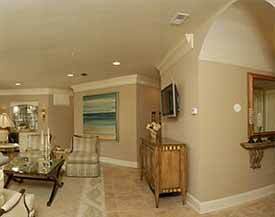 Eight lighting packages are available, along with other options like ceramic tile flooring and gas fireplaces. Each homeowner has one secured garage and one private parking space. This unique location also affords ample parking, close to the complex, for as many guests as you desire. The look and feel of these condominiums are easy to fall in love with, that-s because The Village at Mayfaire is much more than just a home! 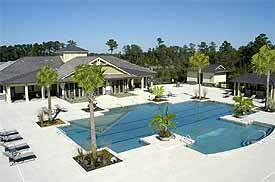 There are an abundance of amenities for you to take pleasure in within your very own community. The amenities include a clubhouse consisting of a great room and billiards parlor, a 24-hour cardio center, a weight lifting room, and an aerobics and yoga room. Enjoy the outdoors in the heated spa, lighted tennis courts, a junior Olympic-size pool, and an 18,000 square feet pavilion complete with a grilling pavilion and beverage center. A twenty-five seat movie theatre is also available along with a business center, a concierge service, and a car care center. Everything you need or want is just steps from your own home. This community is definitely a dream come true! Visit Wilmington, North Carolina to experience, first hand, this astonishing coastal condominium community; The Village of Mayfaire. 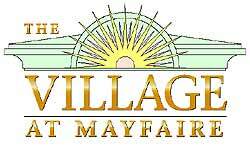 For more information, contact the Sales Office at (877) 971-9771 or visit www.thevillageatmayfaire.com.